Every four to five years or so, a "new class" of wedding professionals comes on the scene, armed with moxy, grit, and big goals. Many are talented, many launch new products or services tailored to peers "because it didn't exist in the industry" (this is never true, it just means they weren't good at paying attention), and many become savvy at marketing themselves on a bootstrapped budget. A handful out of each group find themselves in a position of leadership early on or with a reputation as the new wedding industry "it girl" (or guy). Many people who become one of the go-to experts or "mini-celebs" in their field – especially those whose 'stardom' happens while they're in their twenties – assume that their good fortune and industry position will continue forever, as long as they keep working hard. Because their popularity allows them to command higher prices, they often make their plans for the future with the expectation that the level of money they're bringing in now will not only continue, but consistently increase. They then spend their income on bigger and better things: a closet full of designer clothes and handbags, flashier cars, first-class upgrades on every flight (no matter how short), and giant custom homes designed with their giant, custom dreams in mind. Then suddenly one day they notice that they're no longer the most in-demand photographer. Or they pick up the latest issue of Town and Country and realize they're not mentioned at all among the bridal trend experts. Or they got knocked off this year's list of top floral designers in favor of someone they've never even heard of. Or they launch a workshop that has always sold out and zero people sign up. And they were not at all prepared for this change in status – emotionally or financially. If you've been in the wedding industry for longer than a decade, you've seen this cycle, too. Some of the biggest names in the wedding and social event space just ten years ago – with book deals and speaking engagements and ultra-celeb clients to match – are practically invisible now, and not by their own choice. Let me be clear: none of the types of purchases mentioned above are right or wrong. Where these people got tripped up was assuming their business and popular role in the industry would continue to be a cash cow for as long as they wanted. As a result, many did not have their savings and investment accounts where they needed to be to help them ride out the slow seasons. Several people in the most recent "new class" are currently falling prey to this mentality, and it is painful to watch. If you're one of the current go-to industry experts – and especially if you are newer to the industry and in your twenties or early thirties – take advantage of where you're at today to plan well for an unpredictable future. Work to stay relevant, but realize you may have years that are more difficult to book or your educational courses won't sell, and plan accordingly. In the words of my friend and industry veteran Debbie Geller, "When you have a good year, buy some nice shoes, but set money aside for a rainy day." When it comes to buying new products or hiring people to help your business get unstuck, consider who’s telling you what you "have to do" and always ask yourself, "what are they really selling?" "You need to be on most social media platforms to be relevant." Does the person preaching this sell social media management services? Does it make sense for your business to be on Snapchat or Instagram? For some companies it does, for others it doesn’t. This also depends not just on your target market age demographic but on geographic region as well. "You have to have a custom website to stand out." Maybe you do. Or maybe a branded Shopify or Squarespace site is the right fit for what you need. If the person preaching this sells web design, they may truly believe this to be true – but they also sell custom web design and need to pay their bills. "You need the latest software to maximize productivity and efficiency." I love a good technology solution, and the latest and greatest may make your life more streamlined. It may also be a cost you don’t need to take on right now. You may just need a well-optimized Excel workbook. "You need ongoing SEO services." You might, depending on the type of business you run. You may also just need to do the tedious, long-game work of writing a blog post several times a week so that your site has consistently new content and new keywords for Google to index. "You have to take this online course." Maybe the course will be full of useful education and will be a timesaver. Maybe you just need to read a couple books from the library or take a free EdX online class through MIT or Harvard. "You have to rebrand every 2-3 years." This may be the most ridiculous claim of them all, and true branding experts will never pretend it is true. This advice only comes from charlatans. "You have to have an app for your company." You probably don’t and, more importantly, you probably shouldn’t. An app that only regurgitates your social media feeds and gives contact info just eats up phone storage space and actively brands your company as one that will waste someone’s time and money. "You have to work with a business consultant to help your business get unstuck and grow." Maybe you do. Maybe you don't. Sometimes the time isn’t right to bring on a consultant. And I say this as a business consultant who pays my bills by helping wedding industry leaders succeed. I fully stand behind the insight, wisdom, experience, and expertise I bring to the table, but I am never going to sell you something you don’t need. Sometimes you may just need a business-focused weekend retreat with a small group of smart colleagues you fully trust to call you out on your blind spots. Friends who truly want the best for you but aren’t attached to your business the way you are. "You have to pay to join a mastermind in order to be fully emotionally invested." Paid masterminds were the "it business" in the mid-nineties, then again in 2007, and now they're back once more. There are times when a paid mastermind with strangers you’ve never met or acquaintances you barely know makes sense. As it relates to my last point though, the group of colleagues works best when they are people you have history with and deeply trust. Always consider the source on who is telling you you have to join a paid mastermind in order to get the most out of the group. There are many paths you can take to make your business better, and there are times where making those investments make sense. 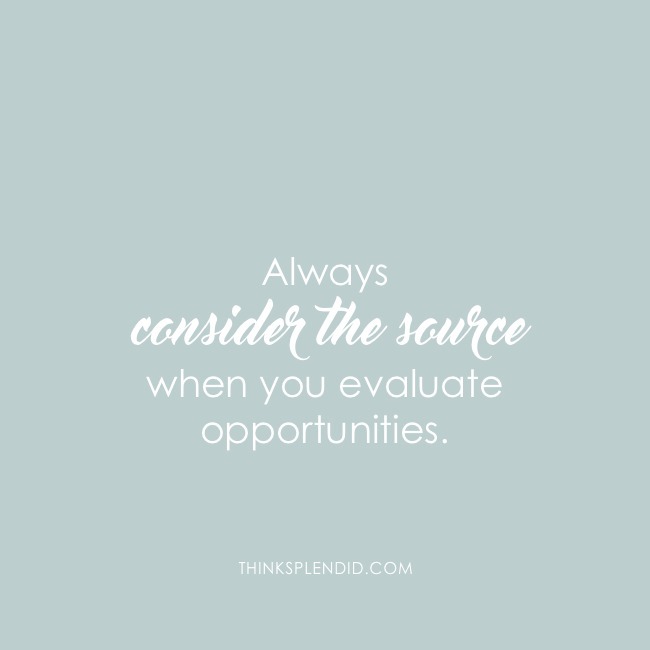 As you evaluate opportunities though, always consider the source.